Are you ready for a new twist on an old fairy tale? 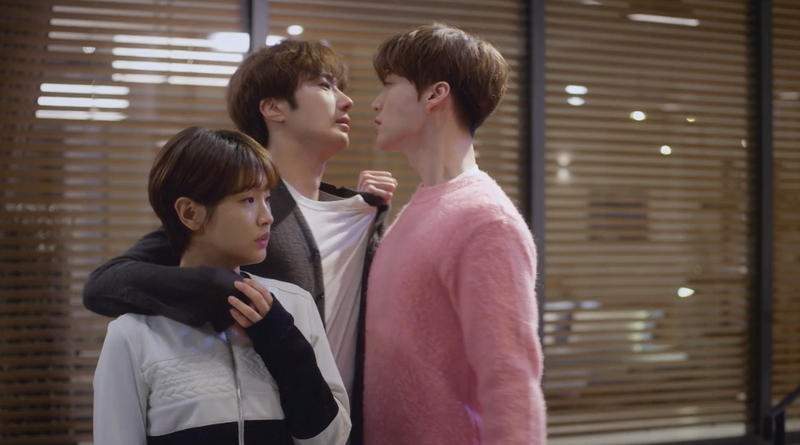 Cinderella and Four Knights gives us just that. Some things are the same, some things are fresh, but it all blends together to make one entertaining “Cinderella” Kdrama. At a club, third generation rich boy, Kang Hyun-Min announces to the guys there that he intends to go to his grandfather’s fifth wedding taking “the next girl who walks in the door”. Seconds later a pizza delivery girl comes in, and when the guys who ordered the food give her a hard time and refuse to pay, she forces the issue by beating up each one of them. Hyun-Min is curious about this feisty girl and decides to follow through on his promise. After all, the poor, unrefined pizza girl is just the type of woman his grandfather would object to him being with and in Hyun-Min’s mind that would be an added bonus. He doesn’t like his grandfather and this girl could help him ruin the wedding. Since delivery girl Eun Ha-Won needs money for college and Hyun-Min is willing to pay for her services, she goes with the young stranger and is shocked when he introduces her as his fiancé. She’s also appalled at the rude way Hyun-Min speaks to his grandfather and physically forces him to his knees to apologize. It isn’t long before Chairman Kang has his secretary bring Ha-Won to him and offers her a job – live in the mansion (named Sky House) where his three grandsons reside and bring the three cousins, who dislike each other immensely, closer together. If she succeeds in the “missions” the chairman assigns her, he will pay for her to go to college. Now, how difficult could that be? Oh, there’s one stipulation – she can’t date any of his grandsons. Well, that won’t be a problem… or will it? Eun Ha-Won is a sweet girl who is days away from graduating high school. Her father is a truck driver who is away months on end and she lives with her step-mother and step-sister who happen to be selfish, money hungry, and just plain mean. Ha-Won’s deceased mother wanted her to go to college and she’s determined to make her mother’s wish come true. Kang Ji-Woon doesn’t want to have anything to do with his cousins or grandfather. He was raised by his single mother, who is now deceased, never knowing anything about his father. One day he’s informed he’s the grandson of a tremendously wealthy chairman. However nice that may sound, Ji-Woon is resentful that the man has never acknowledged him before and now wants to dictate what Ji-Woo should do with his life. The oldest Kang cousin, Hyun-Min, is egotistical, arrogant, outspoken, and cute. He’s a rich boy who flaunts his money and assumes he’ll be the heir of the Kang fortune/company. He’s a huge flirt, a big tease, has a very blunt way of speaking… and why is he so mean to the girl he likes? The third Kang grandson is a huge Kpop star. He’s a singer/songwriter who is loved by tons of girls. He is kind and doesn’t seems to have anything against his cousins but being a busy star who can’t spare a lot of time makes him come off as a bit aloof. Secretary Lee Yoon-Sung is Chairman Kang’s devoted right-hand man. He is respectful and tries his best to get along with the three Kang grandsons. He is protective of Ha-Won and definitely on her side. Park Hye-Ji is a talented “wanna be” clothes designer who is in love with Hyun-Min and best friends with Ji-Won. 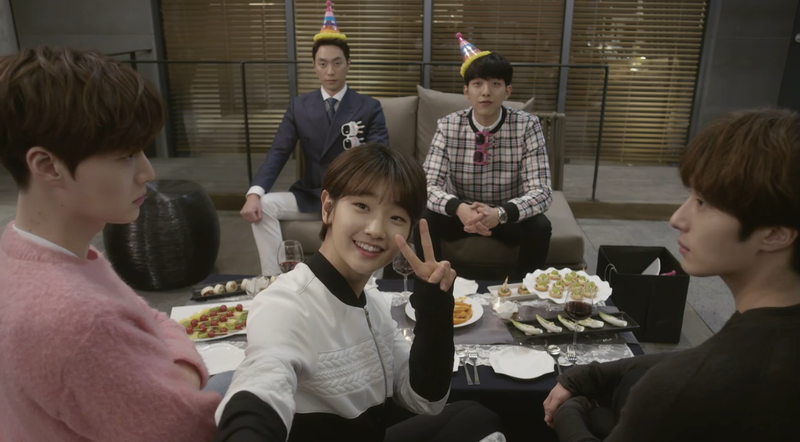 This is the first thing I’ve seen Park So-Dam, who plays Eun Ha-Won, in and she plays the sweet, little Cinderella role perfectly. Her chemistry with all four “Knights” is very good – having a completely different kind of relationship with each man. She is just plain darling. I look forward to seeing her again. I’m anxious to find out if it is Park So-Dam or Eun Ha-Won that I like so much – maybe it is both. The first time I saw Jung Il-Woo, who plays Kang Ji-Woon, was in Flower Boy Ramen Shop and I didn’t like his character or the show that much. Then I saw him in 49 Days and cried my eyes out. Next was High End Crush, a so-so romantic comedy webdrama. I love him as one of the “Knights” in this show. His character really develops and Il-Woo shows that growth well. He’s one actor who looks good with orangish hair, and he has a cute smile too. My introduction to Ahn Ja-Hyun, the actor who plays Kang Hyun-Min, was a little over a year ago when he played a vampire doctor in Blood. Did you know he married his love interest co-star from that drama, Ku Hye-Sun? They skipped a traditional wedding and donated the money they would have spent on a fancy ceremony to the pediatric ward of a hospital. Since they met while working together on Blood, which has a hospital setting, it’s kind of cool that two big stars would forgo a huge wedding and donate that money to a place that signifies where they first got together. Rock group CNBLUE member Lee Jung-Shin, plays Kang Seo-Woo, a character that is very close to who Jung-Shin is in real life – a singing star. I’ve mentioned this before but I’m a huge CNBLUE fan. I’m glad the director and writer capitalized on Lee Jung-Shin’s musical talent and had him do a tiny bit of singing on the show. Too bad he didn’t get to sing an entire song for the soundtrack (that I’m aware of). Aside from Cinderella and Four Knights, Choi Min, whose character is Secretary Lee Yoon-Sung, has been in three other Kdramas I’ve seen – Pasta, which I loved, and Yong Pal and Super Daddy Yeol which I didn’t really care for all that much. Have you seen him in Pasta, yet? Apink member Son Na-Eun plays Park Hye-Ji. Funny they’d have one of the group’s other members, Yoon Bo-Mi, sing on the soundtrack but not Na-Eun. I’ve seen Na-Eun before in Twenty Again, playing a young college freshman who is in love with the leading lady’s son. The girl she plays is an extrovert in that show but in Cinderella and Four Knights she plays the role of a very quite and reserved young woman. I think she managed to play both characters convincingly. This show has a very creative opening. The whole thing is done with Legos. There’s a Lego castle and then each character is put together with the toy bricks as well. It’s quite clever. One thing I thought was clever was having superstar singer Kang Seo-Woo (CNBlue member Lee Jung-Shin) yell, “Oh, CNBLUE!” to divert the attention of a ton of high school girls surrounding him so he could get away. I wonder if that was Jung-Shin’s idea or something the writer threw in for giggles. Since this is a drama based on romance and love I’m glad the director let the characters kiss like normal people would and, I’m happy to announce, it’s very obvious Jung Il-Woo knows what a real kiss is. Every single song we hear goes perfectly with the show. Nothing seems out of place or awkward. It all works well and compliments whatever scene it’s accompanying. BtoB sing one of the most often played songs on the show, For You. It’s definitely hard to sit still during that one. I found myself humming it even after I had finished the show. Yoon Bo-Mi, from Apink, sings a song entitled Without You. That one sticks in your head without you even realizing it. I Believe, performed by singer/songwriter Go Yoon-Ha (better known as YOUNHA), is my favorite ballad of the entire soundtrack. The scenery in this drama is very aesthetically pleasing. Sky House, where the Kang cousins reside, has a very unusual floor plan. All of the bedrooms open to the same den/living room area. You can see inside one bedroom from the window of the other. Kind of a unique idea. The outside is beautiful with a little stream, lots of green grass, and a huge driveway. This “house” is actually the clubhouse of the golf resort known as South Cape Owners Club on the southern coast of Changseon Island. No wonder it didn’t have a traditional style bedroom arrangement. Also, the Kang gang goes on a retreat (mini vacation) and the area they visit is lovely. We even get to see “Cinderella” and one of the “Knights” go horseback riding together. Don’t think Cinderella and Four Knights is a fairy tale re-enactment. It has several similarities to the story of the glass-slippered girl but is much, much more than just the account of a Disney princess. You’ll like these characters and enjoy watching each and every one of them grow up and mature.